Let’s clear up some misconceptions about what you can do when you want to turn right at traffic lights where there’s no green turning arrow. If everyone follows these rules, more traffic can flow through the intersection. As soon as the traffic lights turn green, the lead car can move into the intersection as long as the road that it’s turning into isn’t blocked. If the lights turn red then there’s nowhere for the car to go – it might not be able to reverse if the vehicles behind it have moved up to the line, there could be pedestrians waiting to cross on the right, and it can’t fit into the lane where the line of red cars is waiting. But if there is no blockage in the road, then it’s permitted to pull into the intersection and wait. The vehicle is even permitted to turn as the lights go yellow or red. For this reason, it’s important that your wheels have cleared any induction loop that triggers a red light camera. As the road is clear, you can wait to turn. 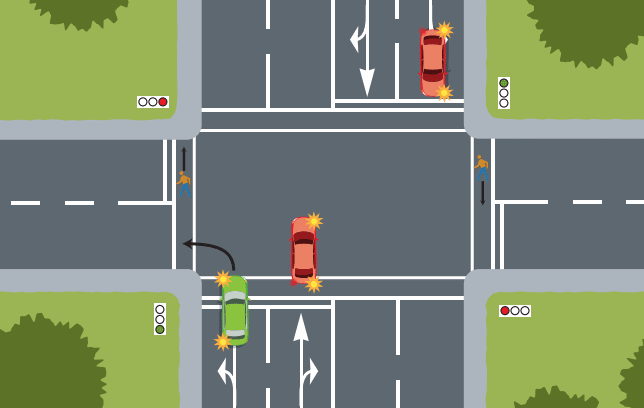 While it’s OK for one vehicle to enter the intersection, it’s not OK for two or more. Not using these rules causes frustration for drivers behind you as it causes extra traffic delays. Clause 4.5(2) of the Land Transport (Road User) Rule 2004: Despite anything in Part 3, a driver approaching an intersection or an area controlled by traffic signals must not enter the intersection or controlled area if the driver’s intended passage or exit is blocked by stationary traffic.